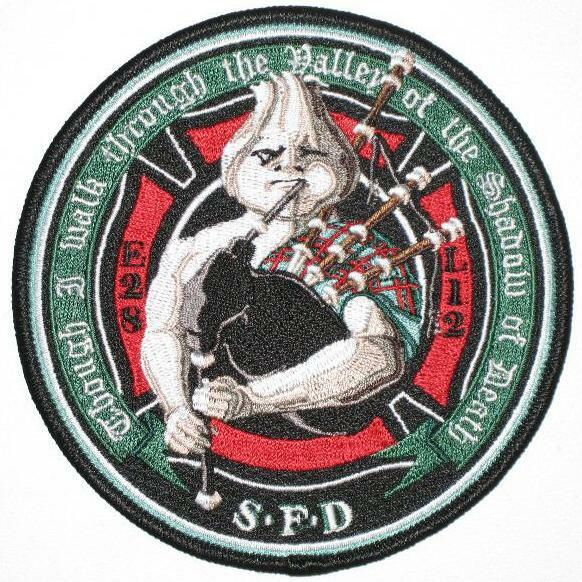 Pipes and Drums is a social and charitable organization of firefighters. Station 28's "Garlicman" honors Rainier Valley's history as an Italian enclave, known as "Garlic Gulch" well into the 1950's. Unfortunately, our friends were called away to more urgent duties before we could snap a picture of them, or even get their names, but we can at least show you the patch. Columbia City friends and neighbors: You can see the Garlicman patch live and in person at our office at 3710 S. Ferdinand Street, right across the street from Bike Works. We're open W-Th-F 10 am to 1 pm, or by appointment. You can also see our Columbia School display, browse our collection of historic photos, become a member, or sign up to volunteer — and maybe next time four handsome firefighters drop by in their rig, you'll be here to see it!